CHILDREN; Children under the age of 12 are permitted on safari at the sole discretion of the manager or guide. Children under the age of 6 are not permitted on safari, and where possible, a kiddies safari will be arranged between normal safari times. The lodge reserves the right to impose similar restrictions for family unit guests if it is believed that safety may be compromised. Baby sitting facilities can be arranged at the lodge at an additional charge. 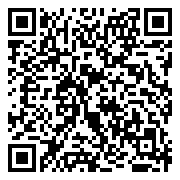 Children – 50% of the per person sharing rate when sharing with two adults. Additional children under 12 years sharing with adults in Deluxe Safari Suite will be charged 50% of the Standard Suite sharing rate . 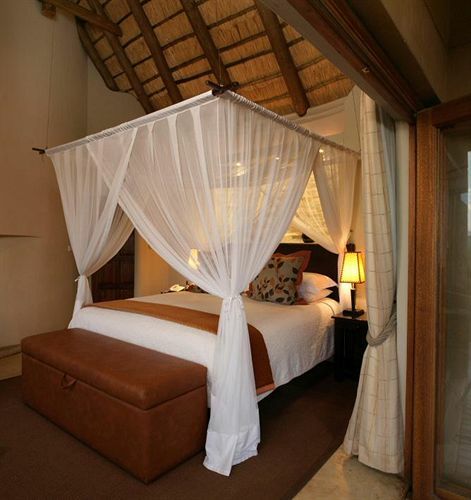 Standard Suites - Accommodation, all meals, teas & snacks, local drinks on safaris and 2 daily safari activities. Rate exclusions; Park entrance fees as determined by North West Parks & Tourism Board, which may be subject to change without notice, select premium brand drinks, bed levy of R 5.70 per person per night (subject to change without notice) and items of a personal nature. Please note a surcharge may apply to certain dietary requirements. Rise in the morning to an African dawn and enjoy an early morning game drive with your dedicated professional ranger. Relax as your ranger guides you through the bush on a custom made open Landrover, searching out the Big 5 or the smaller secrets of nature. Set out on a foot safari with your armed ranger and learn the secrets of tracking African game or just enjoy the trees, birds and stunning scenery. 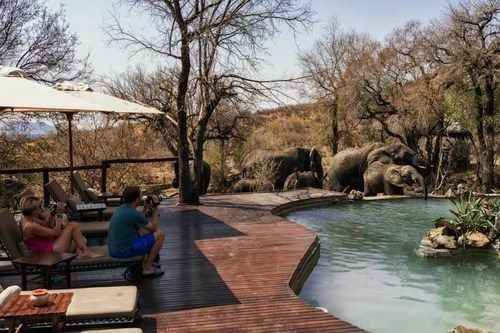 Return from the excitement of the bush to a sumptuous breakfast or brunch and then relax at the pool or the sala overlooking the waterhole where game may come to quench their thirst. In the afternoon, when the heat of the African sun has diminished and the shadows are longer, head out again on a sundowner safari, where you will stop to watch the sun set on this bushveld paradise and enjoy your favorite sundowner drink. Once the sun has set and darkness descends, set off again for a night safari where the more nocturnal creatures now rule the bush. 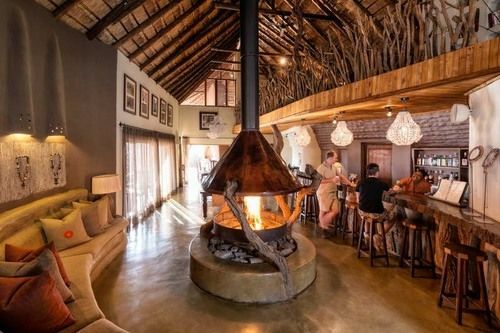 Return to the lodge where you will be treated to the finest Pan-African cuisine with your hosts in the open air boma, and share your days adventures, while you enjoy a night cap around the fire. 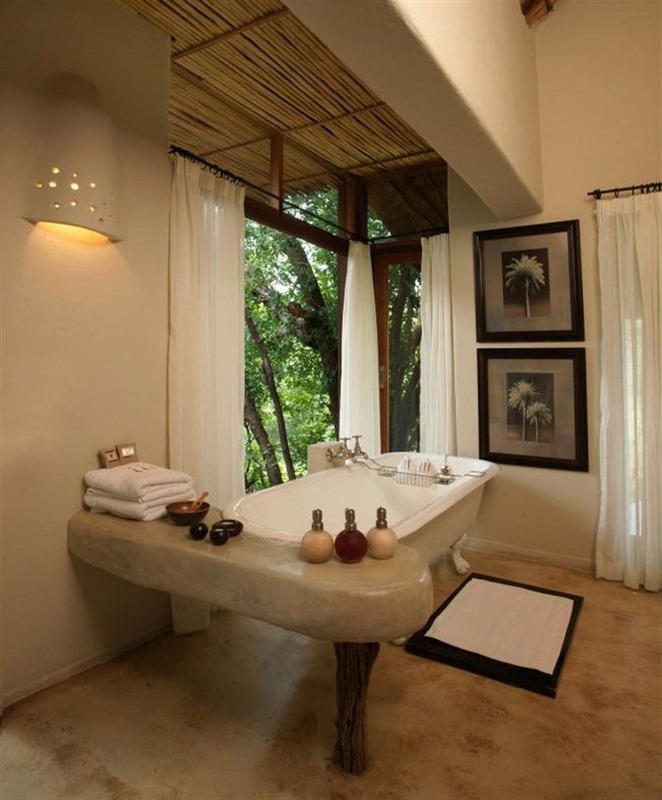 This is a typical day here at Impodimo where your safari experience will unfold. All our rangers are highly qualified and experienced, and undergo regular evaluations and ongoing training to ensure that they are up to our very high standards. 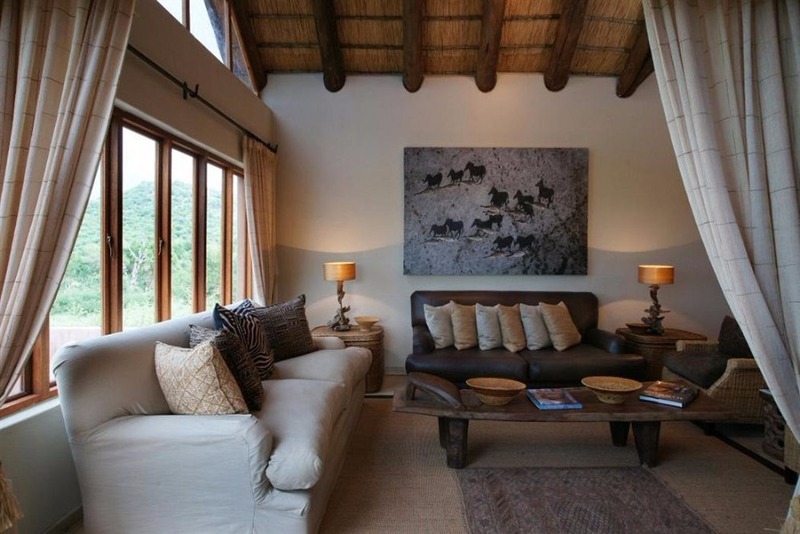 The Lodge Surrounded by over 3800 hectares of undisturbed BIG 5 Game Reserve and the famous Drakensberg Mountains Tshukudu Game Lodge provides a relaxed home away from home. 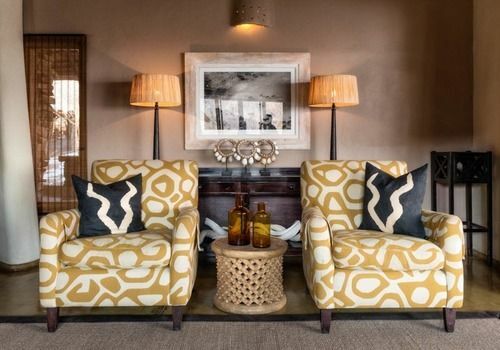 Welcome drinks are served in the open plan reception- and lounge area on arrival and our free Wi-Fi service is available to all stay-over guests should you wish to connect with family and friends back home. 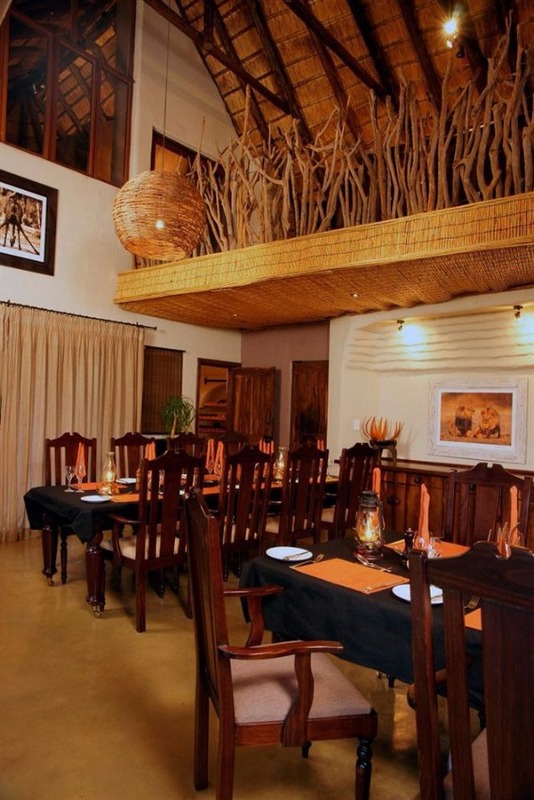 African Dining Buffet style breakfasts and light lunches are served on the thatched veranda and showcase South African dishes prepared from fresh local ingredients. Evening buffet dinners are often enjoyed seated around a roaring fire in the African Boma, under the stars. 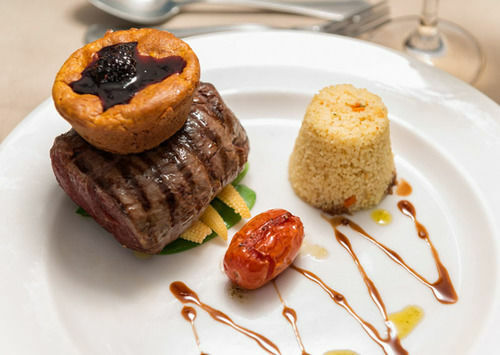 Traditional venison dishes also feature on this authentic South African menu. The Rooms Each of the 14 spacious air-conditioned chalets/rondavels/family units are named after the raised and rehabilitated animals of Tshukudu.Provision has been made in certain units to accommodate the access of wheelchairs facilitating the disabled or elderly. 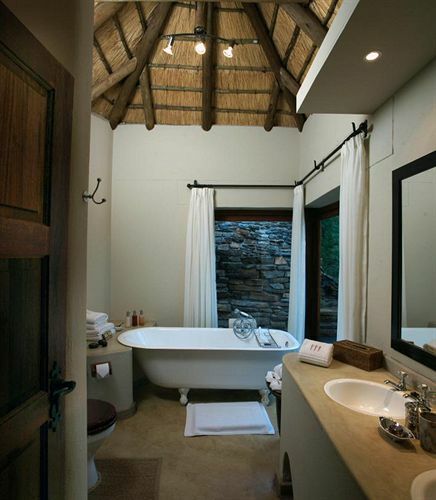 Each en-suite unit is equipped with a shower, minibar, coffee and tea-making facilities as well as a safe. Amenities are replenished daily. Hairdryers and international plugs can be obtained from the Reception desk. 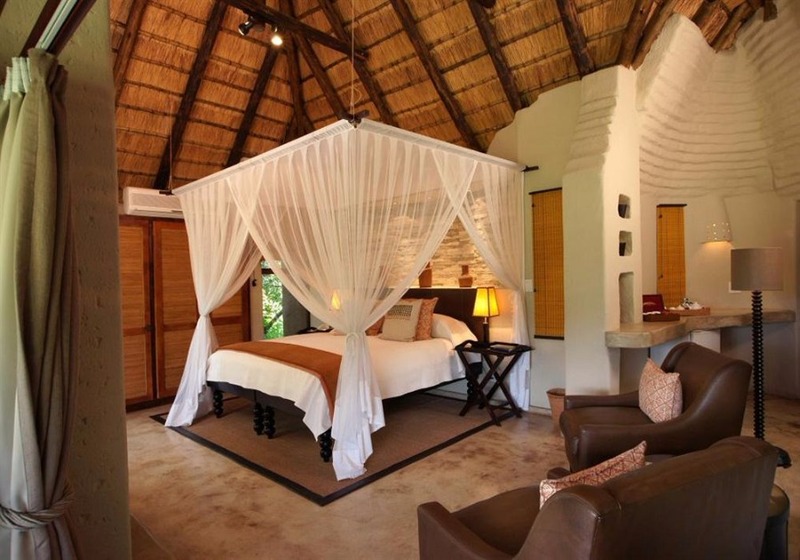 Swimming Pool Recliners under a canopy of thatch beckon guests to enjoy shady relaxation around the pool, which is also a prime vantage point for game viewing. 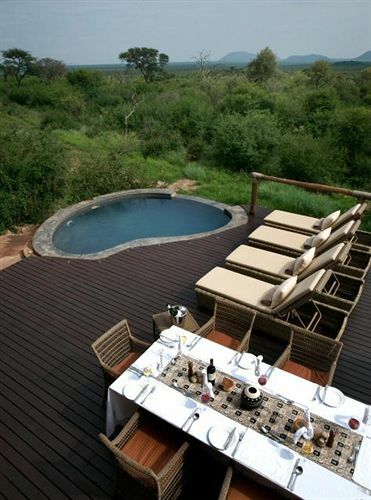 A waterhole lies just beyond the perimeter of the Lodge and attracts various antelope species, elephant and buffalo. 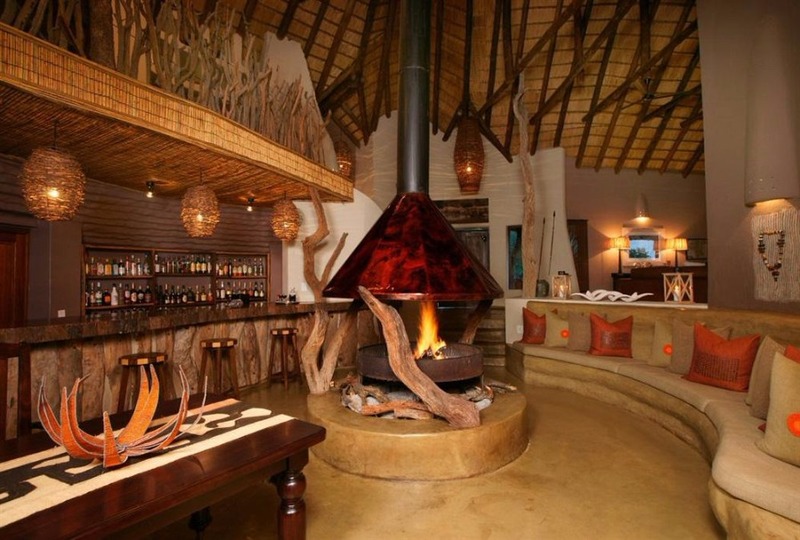 Indulge in the peacefulness of the African Bush while our trained staff brings you your favourite cocktail to enjoy. Curio Shop Not your regular curio shop, you will find original treasures that have been gathered from all corners of the African continent as well as functional items such as hats, caps, beanies and T-shirts as well as postcards, toiletries and various small trinkets that will remind you of your African Safari. Drive from Johannesburg to Magaliesburg along the N14 and the R 24. From Magaliesburg, take the R509 through Derby to Koster (69km) Turn right in Koster to Swartruggens. (34km) Continue straight through Swartruggens towards Groot Marico and Zeerust. You do not actually pass through the town of Groot Marico After entering Zeerust, keep straight on until you see a sign for Gaberone / Madikwe Game Reserve. Turn right there. Continue on this road through 2 rural villages and past Madikwe Road Takeaways (a store and filling station) and past Nietverdiend (a store, filling station and police station). Continue on this road past the Abjagterskop Gate for Madikwe Game Reserve on your right. (Thatched entrance with flags etc.) 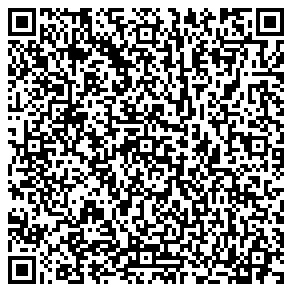 for 7km. 7 km past the Abjagterskop Gate, you will find another gate (Wonderboom gate) on the Right into the park. We will meet you here. 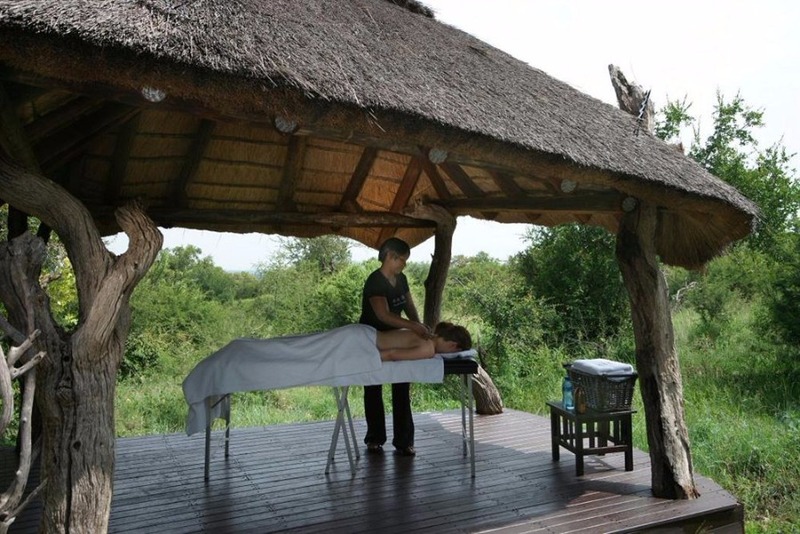 Bush Walks Each day guests are offered the opportunity to experience our Nature Reserve on foot. Bush Walks provide a unique opportunity for nature lovers and adventure seekers to experience the amazing African wildlife up close. Each bush walk is led by a highly qualified, enthusiastic, Game Guide ensuring guests safely experience this unique experience.Depending on their age, young children will join in open game drive vehicles for safety reasons. Guests will kick-start the day with steaming hot coffee and homemade rusks, before venturing out at around 6:30 am. At around 8:00 am guest return to sit down to a sumptuous breakfast buffet. 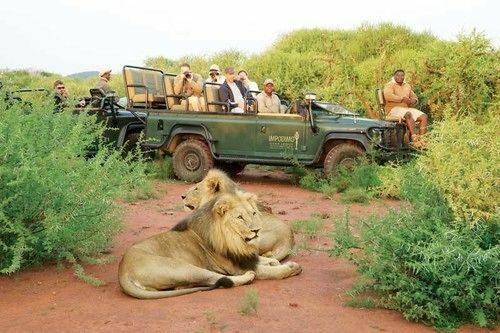 Game Drives Our highly skilled Game Guides will accompany guests in the morning and early evening in open 4x4 game drive vehicles. Their extensive knowledge and training ensures that your game experience will be unforgettable, exciting and informative. 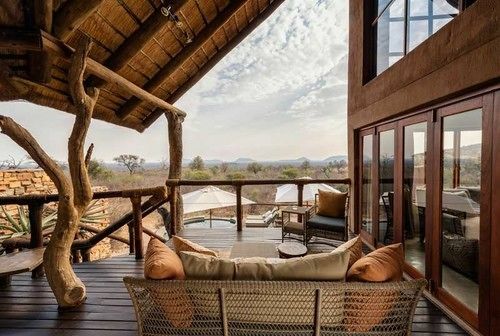 This private reserve is known for its close encounters with a vast variety of game including the Big Five (lion, leopard, elephant, buffalo and rhino). 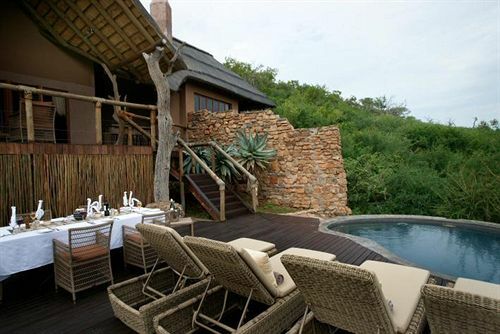 In addition, all game drives on the reserve coordinate their game viewing activities which ensure the best of sightings. Halfway through the early evening game drive there's a stop for sundowners and snacks, before returning to the lodge at around 7:00 pm, with enough time to freshen up before sitting down to a buffet dinner served in the open air boma (weather permitting).Activity time table will vary in summer and winter months. Carved from the hillside, eight glass fronted luxury chalets line a natural spring, each enjoying striking views either from within or from the outdoor shower. 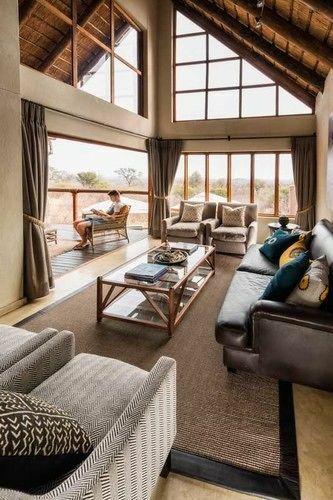 The lodge enjoys spectacular vistas extending as far as the eye can see, your choice may be to visit in summer and laze on the pool deck with a chilled chardonnay. 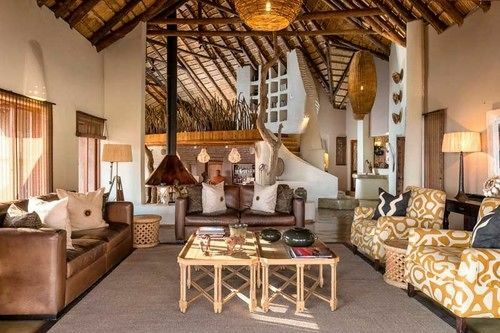 Or maybe a winter safari - retire to the library with a cognac or stoke the fire in your suite, gaze out at the stars before drifting away with vivid images of unrestricted close encounters with Africa's big game. 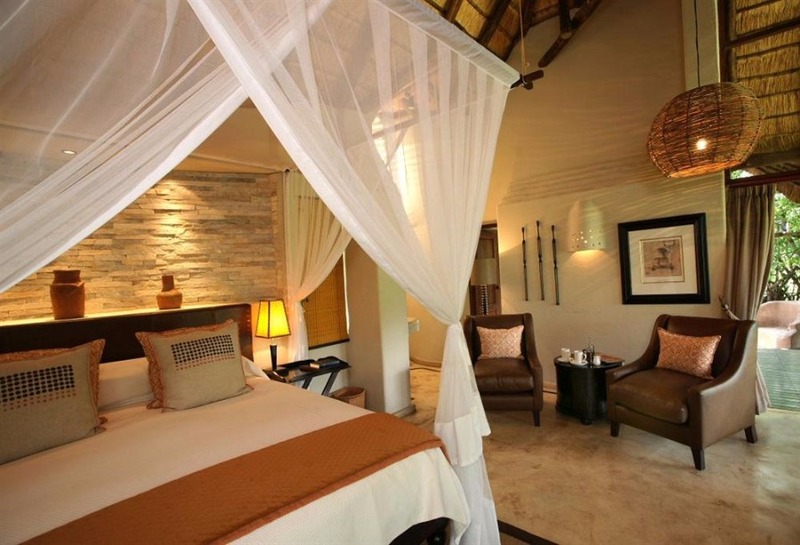 Luxury Suite - Each luxury suites features twin beds with the option of king beds available on request, full en-suite bathrooms with outdoor showers, closed system fireplaces and private deck. Each luxury suites features twin beds with the option of king beds available on request, full en-suite bathrooms with outdoor showers, closed system fireplaces and private deck. 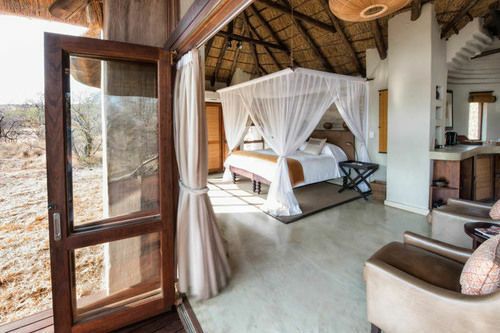 Luxury Suite - Each luxury suites features twin beds with the option of king beds available on request, full en-suite bathrooms with outdoor showers, closed system fireplaces and private deck. Minimum of 2 nights on a weekend. 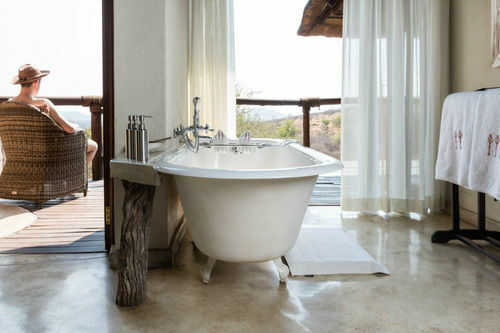 Each luxury suites features twin beds with the option of king beds available on request, full en-suite bathrooms with outdoor showers, closed system fireplaces and private deck. Minimum of 2 nights on a weekend.